From the pioneers of the luxury crossover comes the 4th generation of the venerable BMW X5. Currently, the xDrive40i is available packing a 3.0-liter turbo six cylinder with 335 horsepower and 330 lb-ft, or alternatively the xDrive 50i, powered by a twin-turbo 4.4-liter V8 churning out 462hp. In 2020, a 394-hp plug-in hybrid xDrive45e iPerformance will join the ranks too. In the meantime, combustion models make use of an 8-speed automatic gearbox and xDrive all-wheel drive. xLine trim – with a rugged, off-road design – and M Sport – focusing on the sportier aspects of the X5 – are available, with Premium and Executive tier upgrades comprising enhanced technology and comfort. Priced from $60,700 for the 40i and $75,750 for the 50i, prices are on par with chief rival, the Mercedes-Benz GLE. I can still remember my childhood days when the adults around me would speak of BMW in hush tones as if owning one would be far beyond my mortal grasp. Ultimate driving machines they were called – not exactly a false statement as I've come to learn driving cars like the E46 M3 and E39 M5. Today, however, BMW doesn't just build the ultimate driving machine, it builds plenty of ordinary cars, crossovers, and SUVs too, including the X5, which it calls a Sports Activity Vehicle (SAV). Driving pleasure is no longer at the top of most shopper’s lists. In fact, I would hazard a guess that it doesn't even crack the top ten of car buying choices anymore. Modern shoppers want luxury, connected features, safety options, and so much more. Driving pleasure is almost an afterthought. So, in this new age of connected driving, is BMW still the ultimate driving machine, or has it morphed into something new? We were in sunny Atlanta, Georgia, to test the all-new 2019 X5. From the outside, it would be easy to mistake the 2019 X5 as just a heavy refresh of the previous model. Don't be fooled, while the design isn't exactly a revolutionary departure, this . The X5 is an extremely important model for BMW. 617,000 units of the first generation were sold, 728,000 of the second-gen model, 759,000 of the third, and over 2.1 million in total. It was imperative that BMW got this new X5 right, and on first impressions, there's a lot to love about the new SAV. The X5 doesn't come cheap - that being said, you do get a lot for your money. In the US, the base trim level is the xDrive40i, which is powered by a 3.0-liter turbocharged inline-six (B58) producing 340 horsepower and 332 lb-ft of torque mated to an eight-speed automatic. . There will also be an optional xDrive50i trim for the US market only, which is powered by a 4.4-liter twin-turbo V8 pumping out 462 hp and 479 lb-ft of torque. All of that extra grunt comes at a cost: the xDrive50i model starts at a whopping $76,745. In 2020, BMW will also add a, which will pair two electric motors with an inline-six to produce 394 hp and 442 lb-ft of torque and 50 miles of electric range. BMW will also offer a pair of diesel engines in Europe in the xDrive30d and M50d trims. Both were present at the launch event, but only European journalists were allowed to get their paws on them. The M50d looks particularly intriguing thanks to its quad-turbocharged inline-six producing 400 hp and 560 lb-ft of torque. Sadly, neither diesel engine will be offered in the US. With a starting price of over $60,000, you'd expect the X5 to come with a variety of standard equipment. While your expectations would turn out to be correct, this is still a BMW, so many of the features found on my xDrive40i test car were optional extras, bringing the price above $81,000 as-tested. BMW handed me the keys to a Phytonic Blue Metallic X5 with the Premium and Executive tiers, which bring the cost up to $70,650 by themselves. These tiers add luxury features such as parking assist , a surround-view camera, head-up display, wireless charging, WiFi hotspot, gesture controls, remote engine start, soft-close doors, heated and cooled cupholders, rear window shades, and adaptive LED laser headlights. My car was equipped with the optional 21-inch Y-spoke wheels but 22-inch wheels are also available for the first time ever on an X5. Trust me, the 21s are big enough. I have been very critical of BMW interiors in the past but the X5 shut me up real quick. The simplistic BMW layout is still present, but the execution is finally on par with the rest of the segment in terms of elegance and technology. Optional interior extras included the luxury seating package with massage, Harmon Kardon surround sound, a panoramic glass roof, extended leather, heated rear seats and steering wheel, and open-pored wood trim. BMW also offers a more expensive Bowers and Wilkins audio system with 20-speakers and 1,500 watts proving a symphony that is among the best I've ever heard in a car. My favorite option was easily the glass controls for $650. This replaces the shifter and iDrive controller diamond-cut glass with an illuminated "X" housed on the inside. Volvo may have beaten BMW to the glass shifter game, but this is perhaps the centerpiece of the whole interior and is a must-have option in my opinion. 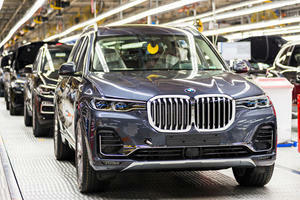 BMW will also offer the X5 with an available third-row seat. I didn't have an opportunity to squeeze myself into it but judging by the proportions of the car, it will only be suitable for small adults and children. Third-row aside, the X5 offers excellent front-row comfort and adequate rear-seat comfort. BMW has made a bold decision to install USB-C ports instead of standard USB outlets, which may pay dividends in the coming years but force you to run out and buy new cables for your children. My test car was also fitted with a few handy dealer-installed options including a coat hanger behind the rear seat and an ashtray in the cup holder. The 2019 X5 is a technophile's dream. BMW's new iDrive 7 infotainment system, which will be called Operating System 7.0 in other markets, pairs an easy-to-use controller with a new touchscreen, gesture controls, and excellent voice commands. The gesture controls allow the driver and passenger to control functions such as radio volume and Bluetooth by waving their hand in certain patterns. I found it to be a bit gimmicky, and as a person who talks a lot with their hands, I could see it being a bother in everyday use. The point is that no matter which method you end up choosing, iDrive 7 gives you plenty of ways to control the car, so everyone will likely land on something they prefer. The system also includes wireless Apple CarPlay compatibility (at a cost) but sadly no Android Auto support. Frankly, when an infotainment system is this advanced, you don't really need CarPlay or Android Auto. BMW has been very set in its ways with certain design elements, including its classic gauges. The , which look extremely dated compared to other cars in 2018. The X5 ditches the analog unit in favor of a beautiful LED screen, which can display map information, adaptive cruise control settings, radio information, and more. This same display will also make an appearance on the upcoming Z4 and 8 Series. BMW hasn't gone as far as Mercedes by making the gauge cluster and infotainment screen one big connected unit, but this new digital gauge cluster finally pushes the interior into the 21st century. Up until this point, my opinions of the X5 have been overwhelmingly positive. Alas, I must voice one gripe with the car. The X5 is available with a host of driver safety features found in the $1,700 Driving Assistance Plus Package that uses cameras and radars to provide partly-automated driving including steering, braking, and throttle. The adaptive cruise control worked flawlessly, but the automated steering made me physically ill. My co-pilot tested the system on the highway and on back roads to see how well it could keep us in our lane, and the system bounced back and forth like a ping pong ball. When it was my turn to drive, I left the system on for some spirited back road driving, and it felt like the car was trying to yank the wheel out of my hand. Eventually, I decided to turn the systems off so I could enjoy the road, but this required a complicated sequence of button clicks on the iDrive system accompanied by a final three-second confirmation push of a button on the dashboard. Remember at the beginning when I said driving pleasure wasn't at the top of shopping lists anymore? Having to hold a button for three seconds just to turn off adaptive steering is a pretty good indication of my point - BMW wants these systems to remain active to the point that it makes it difficult to shut them off. The driving aids likely have varying levels of assistance that can be turned up or down, but on my brief drive, I just decided to leave them all off. Has It Still Got The BMW Magic? While I'd struggle to call it the ultimate driving machine, the X5 wasn't really designed with pure driving pleasure in mind. Yet it's still lovely from behind the wheel. BMW steering is often heavy, but the X5's is extremely light - almost too light - but I'm sure the upcoming X5 M will take care of that complaint. The car is easy to place on a back road (once you turn off the steering assist) and is among the most enjoyable BMW models I've driven recently. The base suspension is a double-wishbone axle in the front with a five-link axle in the rear, while self-leveling air suspension is optional. I had a chance to sample a car with the optional air suspension, which allows the driver to feel the road imperfections without sacrificing too much comfort. Although the car manages to stay surprisingly flat through the corners, I found myself falling out of my seat due to the tall center of gravity and lack of side bolsters. There is a bit more road noise than I anticipated on the highway, the large wheels probably contributing to that. If I had to choose one feature to rave about on the new X5 (aside from the glass shifter), it would be the B58 engine. 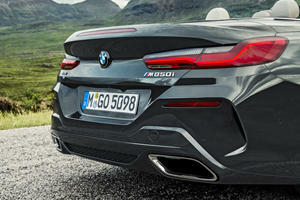 This 3.0-liter inline-six is the current sweetheart of the BMW lineup, better even than the S55 found in the M3 and M4. BMW's bread and butter has always been the inline-six engine, and this one is frankly near to perfection. There is some turbo lag off the line, though this is a vehicle with a nearly 6,000-lb curb weight. Lay on the throttle, and you will be rewarded with a smooth growl accompanied by little pops when you shift or let off the pedal. Once you hit boost, power delivery is extremely smooth and the eight-speed gearbox shifts as smooth as a CVT (in a good way). 0-60 mph in the xDrive40i takes 5.5 seconds, while the more powerful xDrive50i does the deed in just 4.7 seconds. If even that speed just doesn't do it for you, BMW heavily hinted that an all-new X5 M is on its way and should borrow the 4.4-liter twin-turbo V8 from the M5, producing at least 600 hp. On the road, the X5 was certainly impressive, but it's off-road where it really shines. To hammer this point home, BMW guided me through the woods, where the X5 tackled sheer vertical declines, streams, and rocky hills with aplomb. Simply activate the car's off-road mode, and the suspension raises up to allow more ground clearance. The infotainment display switches to show information such as vehicle incline and steering position. Combined with the surround-view camera, I knew exactly where the X5 was pointed and how to avoid any obstacle. Even the sheer vertical declines were made easy thanks to a hill descent control system, which modulates the brakes to crawl down a hill at a slow speed. I highly doubt any X5 owner will subject their $81,000 vehicle to such tasks, but it is amazing to know it can be accomplished. The 2019 BMW X5 isn't the type of vehicle you typically think of when you picture the BMW brand. It wasn't built with pure driving pleasure in mind, but it does deliver a pleasurable luxury experience that is sure to impress. 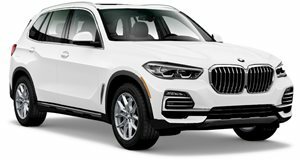 There are other available SUVs at this price level that offer similar size and features, but the X5 stands out by capturing a bit of the classic BMW magic with its wonderful inline-six and buttery smooth transmission. I wish BMW had pushed a little more towards the driving pleasure and pulled a little harder away from all of the semi-autonomous features, but the X5 still manages to strike a nice balance of elegance, driving enjoyment, and technology overload. It receives a well-deserved rating of Great Buy.